Young adults in college have long been associated with the dangerous act of “binge drinking.” Which is when men consume 5 or more drinks or women consume 4 or more drinks in about 2 hours, according to National Institute of Alcohol Abuse and Alcoholism (NIAAA). Those who binge drink are at great risk of both physical and mental health problems, such as alcohol use disorder. When you are young it is easy to delude yourself into thinking that nothing can hurt you. The mindset is further reinforced by what one sees their peers doing. Young adults say to themselves, ‘Well, at least I don’t drink as much as that person.’ But, it does little good to compare one’s drinking patterns to others. We are each unique when it comes to who will develop an alcohol use disorder. If you are binge drinking, and think it is OK because all your friends do too, please be advised. There are plenty of cautionary tales to show you that binge drinking is far from OK. It is quite the opposite, in fact. 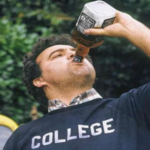 When most people envision binge drinkers, thoughts of the movie Animal House may come to mind. But, it is something that occurs outside of frat houses, binge drinking has long been pervasive on college campuses. Every year, universities spend a lot of time and resources attempting to educate young people about the dangers of heavy alcohol use. Despite the fact that young adults usually do not heed such advice, it appears that some may have gotten the message. A study published in the Journal of Studies on Alcohol and Drugs shows that college binge drinking is declining, Science Daily reports. This is welcome news especially after years of rising binge drinking rates among college students. However, it turns out that binge drinking among young adults not in college is on the rise. "A number of factors may have contributed to the recent reduction in binge drinking and its related problems among college students," says study author Ralph Hingson, SC.D., M.P.H., of the Division of Epidemiology and Prevention Research at the NIAAA. College administrators adopting interventions aimed at reducing harmful drinking. Economic recession in 2008 meant less disposable income for students. The passage of .08 BAC legal limit in every state by 2005. Naturally, rising problematic drinking rates among young people not in school is of particular concern. There has also been more alcohol related overdose hospitalizations and deaths involving alcohol, among 18- to 24-year-olds, according to the article. Hingson says that rising alcohol overdose rates among 21- to 24-year-olds, could be the result of extreme binge drinking. So why the difference between college students and young adults not in school? "Among young adults who aren't in college, there aren't the same organizational supports to implement interventions, and that may be contributing to why binge drinking is increasing in that group," says Hingson. Not everyone who binge drinks is going to experience adverse health effects. But, compared to young adults who drink sparingly and in small amounts, the risks are far greater. Those who establish an unhealthy relationship with alcohol early on are far more likely to experience life problems down the road. Notably, the development of an alcohol use disorder and all the other physical maladies that come with the disease of alcohol addiction. If you or a loved one is binge drinking regularly, there is a good chance that is has already begun to negatively impact your life. Having trouble accomplishing tasks or fulfilling responsibilities is an ominous sign that alcohol use disorder has already taken hold. If you are young and don’t think that you could be an alcoholic this early in life, please take our word that there are no age restrictions on alcoholism. If you believe that you may have a problem with alcohol, please contact Hope by The Sea today. We can help you determine is addiction treatment is the best course of action.